To help reduce the number of adoptable kittens euthanized at no fault of their own in over-crowded kill shelters and finding them forever homes. Small Paws and Playful Claws Animal Rescue is a 501(c)(3) non-profit organization. Here at our rescue kittens are given a second chance at life. We take in orphaned and stray kittens, provide them with needed vet care, shower them with love, and then place them in their new forever homes. Through donations, volunteers, and hard work, we can all work together to end the senseless practice of kill shelters. If everyone adopted their next pet instead of buying from a pet store or breeder, millions of dogs and cats in shelters would be saved yearly. 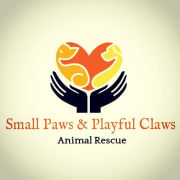 Would you recommend Small Paws And Playful Claws Animal Rescue?